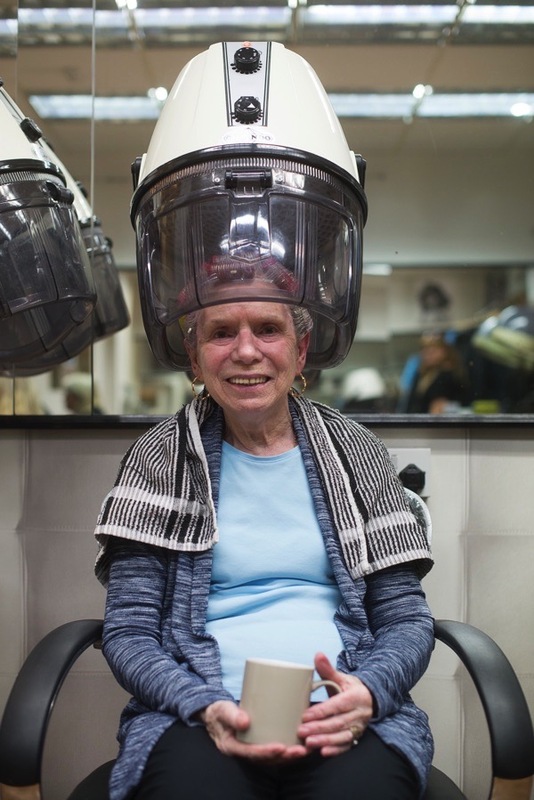 Marcia believes that Clapton Beauty Parlour, opened by her parents in 1930, is London’s oldest family-run salon and I have no reason to doubt her. 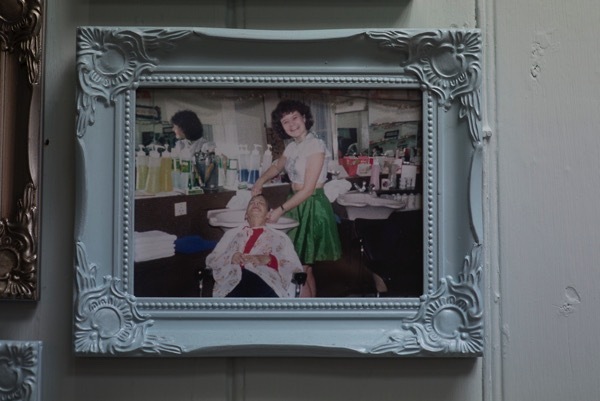 For me, it was the perfect excuse to take another trip to the hairdresser and the ideal opportunity to learn more of Hackney’s hidden hairdressing heritage. 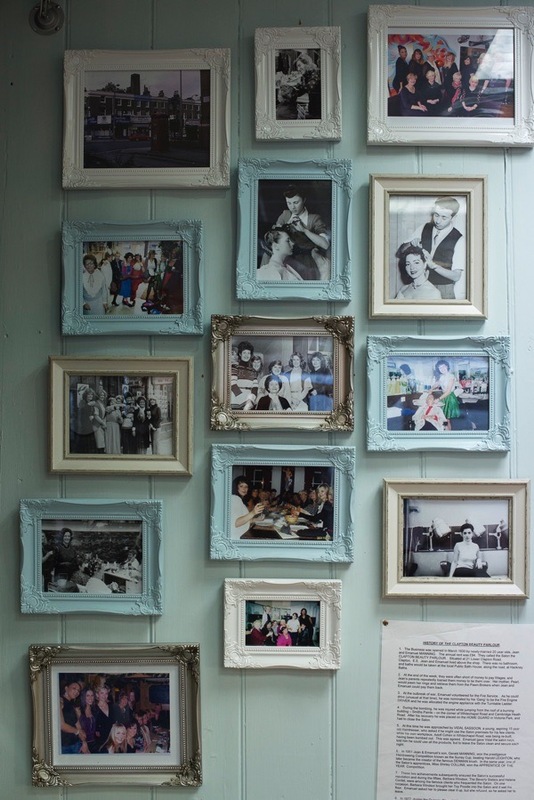 And Contributing Photographer Sarah Ainslie came along to capture Clapton’s celebrated coiffeuses. “Both my grandparents’ families lived in Chatsworth Rd, my mother’s family lived in 104 and my father’s family lived at 83. He had his eye on my mother for a year until he got his opportunity to speak to her when the Prince of Wales visited Hackney. The route took him along Chatsworth Rd, so my father positioned himself behind my mother in the crowd and tapped her on the shoulder and asked to take her to the cinema. My aunt went as a chaperone, that’s what good class people did that in those days. My mother was maybe sixteen or seventeen and they started a courtship, and got married when mother was twenty-one in 1930. She was five months older than my father so, when they took the lease on this salon, it had to be in her name. She was already twenty-one but he was still twenty and they opened at Easter to catch the business. My father’s family were all barbers. They lived above the shop at 83 Chatsworth Rd and the younger four brothers were all taught barbering by the eldest. Originally, the family came over from Russia where they were lumberjacks – none of them were barbers, it started here with the eldest brother. My father began when he left school at twelve and had to go out to work, he was a natural hairdresser. 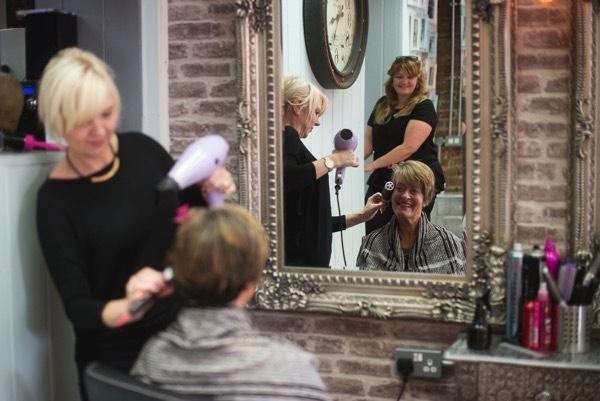 I recall him saying that hairdressing is a young man’s trade, because physically you cannot stand all day after the age of forty or fifty and because it’s the youngsters who dictate fashion. When they opened this salon, it was ladies’ hairdressing. It was men’s barbering in Chatsworth Rd but when they opened this shop it was ladies only. He switched because he was a very futuristic man and he saw the future was in ladies’ hairdressing. 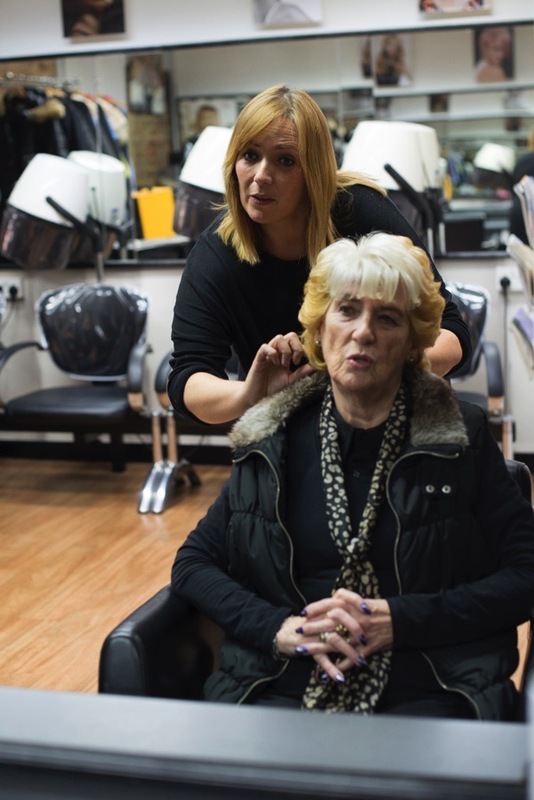 After my parents opened up the salon, they were very often short of money and they would go to my grandmother in Chatsworth Rd who gave them money to keep them going. She would pawn her rings and reclaim them later. They used to worked until midnight. My mother made sandwiches for the girls who were working all day until 10:00 or 11:00pm. 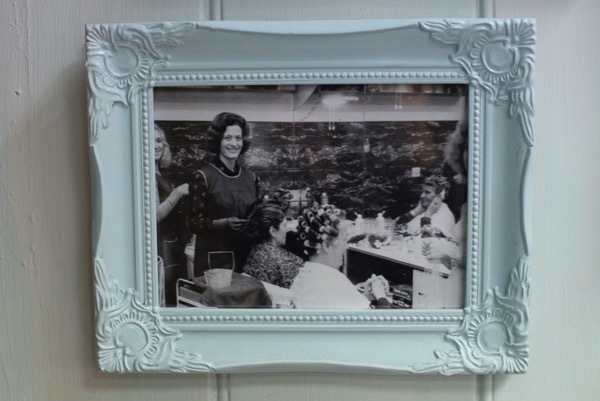 I remember them telling me that customers queued up outside from 6.30 or 7:00am to have their hair done before work. My father was the hairdresser and my mother was very good at beauty and make up. Father took in fancy goods like gloves, handbags and they sold a lot of jewellery. He bought it and she sold it. Father sent her to Revlon and Max Factor to learn to do make up, so she knew all about that, and we sold all Max Factor and Revlon products here and also Leichner theatrical make up. They lived above the salon at first and used Hackney Baths to wash. In 1936, when they had enough money, they bought a house in Upper Clapton. Father was a very advanced man. He learnt to drive and they were the first amongst their friends to have a fridge and a freezer and a mangle for wringing the washing. I loved using the mangle! I first came here in 1974. I was never going into hairdressing. I went to Woodberry Down school in the year it opened and, when we had a careers evening, the headmistress said to my father ‘Well now Mr Manning, we’ve got to discuss Marcia’s future.’ She saw me as a model pupil. Although I had failed the scholarship exam, it was my luck that Woodberry Down opened that year so I became a model pupil and got six O levels and three A levels. Yet my father told her that I would be going into the family business. Well, that was all I needed to hear and I gritted my teeth against it. I went on to become a linguist and I studied at Holborn College of Languages but – low and behold – here I am today. I’ve never done hairdressing but I’ve been running the place. 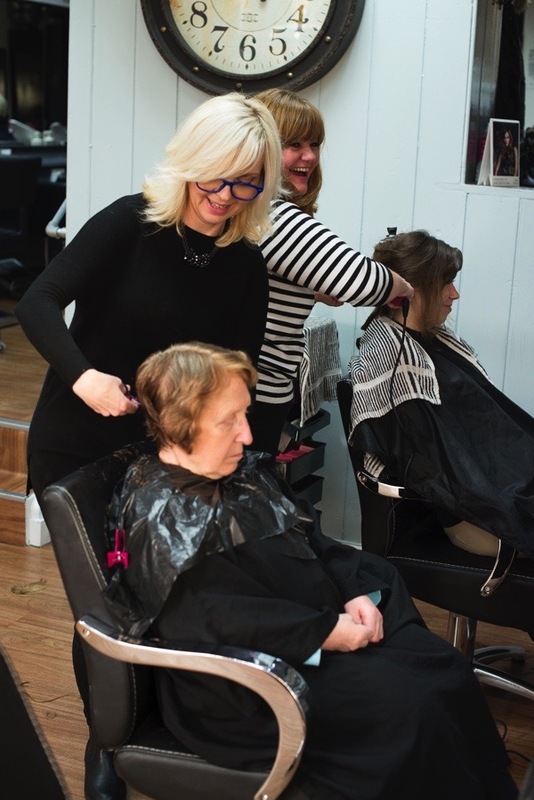 The fact that I never learnt hairdressing has held me back, so I took myself off to Weller to do some short courses, even though you can’t just ‘do hairdressing,’ it’s a four-to-five year apprenticeship. I did colouring and that gave me a certain respect here among the staff. Before that, it was like running a plumbing business without being a plumber yourself, you can’t do it. Here, I’ve been a secretary with languages trying to keep these girls in order. 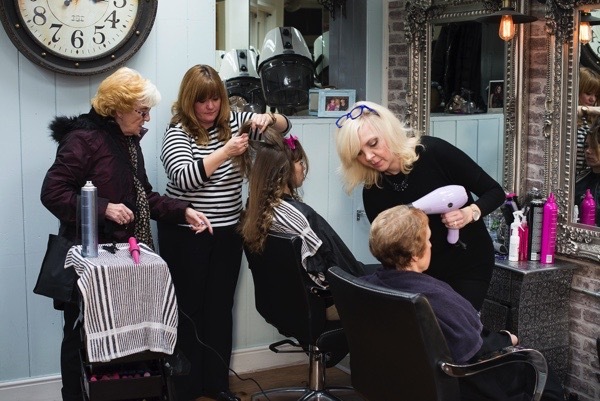 My brother gave me a pat on the back and said, ‘Mum and dad would be really proud of you.’ I’ve managed to bring the salon into its eighty-fifth year. About thirty years ago, there was a big thing about sunbeds, so I decided to go the Hair & Beauty Show at Olympia where they were displaying them. I had some empty rooms upstairs and I got a loan from the bank, and – my goodness it took off – I repaid the loan very quickly. You had to wait for an appointment, it was that busy, and I think this is also what my father found when he started, it took off. We have one customer who is a hundred years old, Mrs Goodman. She is so alert, she comes on Wednesdays and we have lovely chats about the early days. She remembers my father and he has been dead for forty-two years. She must have been coming here for between fifty to sixty years. I have many customers who remember my father doing their hair for their weddings. Once Marcia had told her story and given me a tour of the premises, from the former basement kitchen to the water tank in the roof, it was time for a word with Dawn Hammond, Marcia’s protégé and proud successor. “It was my Saturday day job and I am the owner now. I took over seven years ago but Marcia still comes in two days a week and helps out. I lived just across the road when I was fifteen or sixteen and I saw there was a Saturday girl wanted. 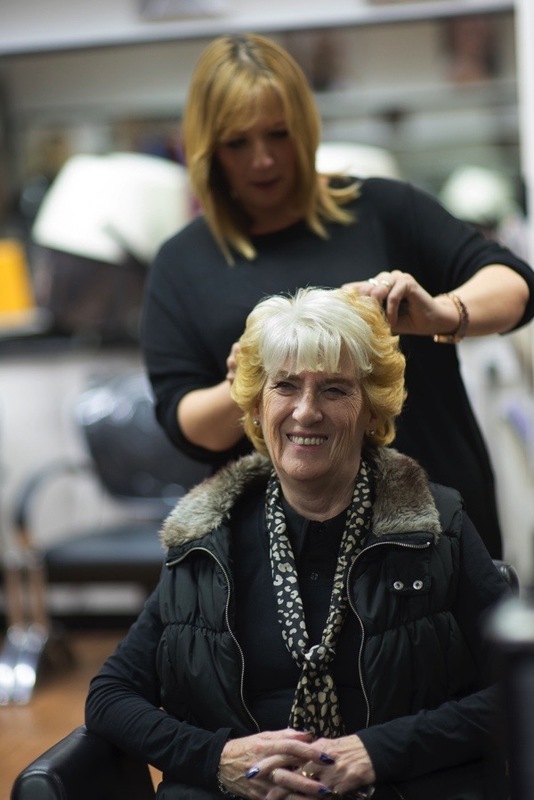 My mum used to do our neighbours’ hair and her own hair at home, she wanted to be a hairdresser but became a machinist. It was convenient for me, I didn’t have to fork out for bus fares and then Marcia took me on as an apprentice. I wanted to be an architect, but I haven’t got the brains for that. In architecture, you have to draw lines but in hair you have to draw angles, 180 and 360 degrees. If you hold the hair up, you just get a short back and side but, if you do an inverted bob. It’s all to do with angles. I am new to your website gentle author but am enchanted. What a brilliant piece. 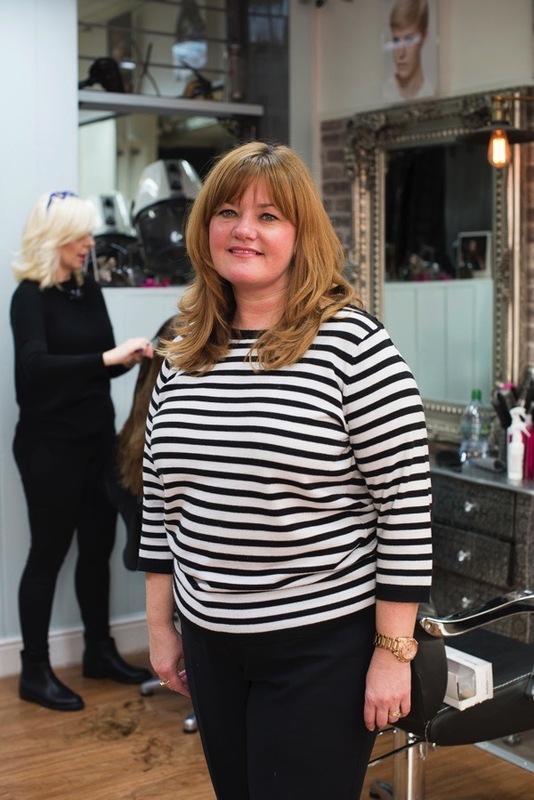 My hairdresser who I have been going to for over 22 years is my friend, mentor and psychologist. I agree with Marcia about that. To a woman, her hairdresser is one of the most important people in her life because a visit to her makes everything wonderful! 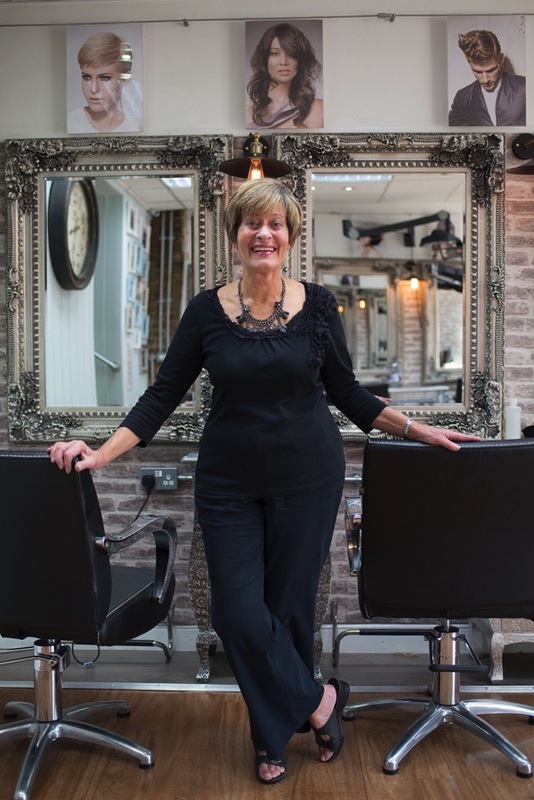 Lisa Whiteman built the business from scratch and is a brave and clever businesswoman, mother and creative genius. Three Cheers for hairdressers. If you cannot get to Clapton go to Webster Whiteman in Pollen Street W1. I used to have my hair cut here as a child. 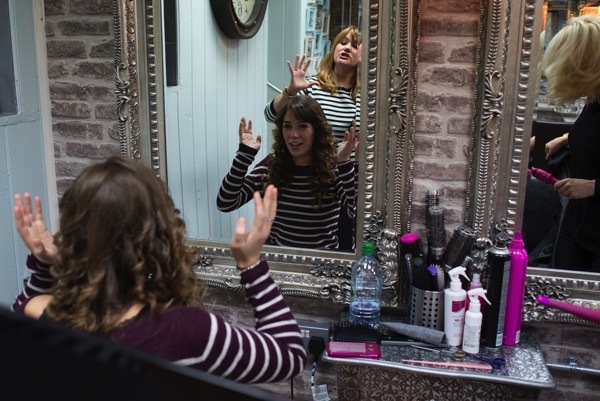 The Clapton beauty parlour was responsible for giving me an unasked for fringe. Apparently my hair was so messy that they thought I had had one before. Interesting that such an ordinary place has now become a rare physical trace of a particular C20th past in Hackney. 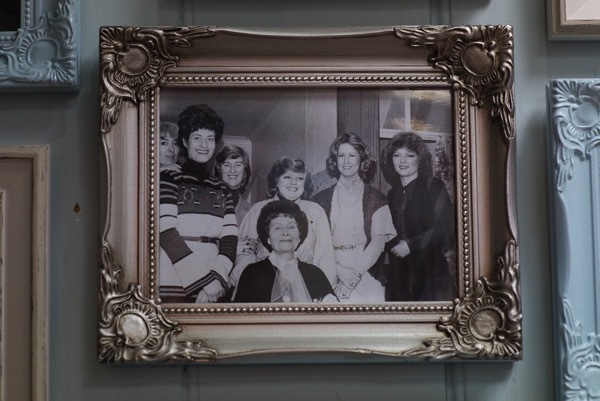 How lovely to see Marcia Manning and the Beauty Parlour recorded for posterity. I was attracted to the shop’s genteel tone and retro charm when I first lived in Clapton, in 1984, and then was one of the first customers for the sunbeds in the 80′s. I had previously used Enid’s Hair Salon, round the corner, which claimed to be one of the first black hairdressers. Once while having an x-ray in Homerton Hospital, I noticed a fish tank in the waiting area. 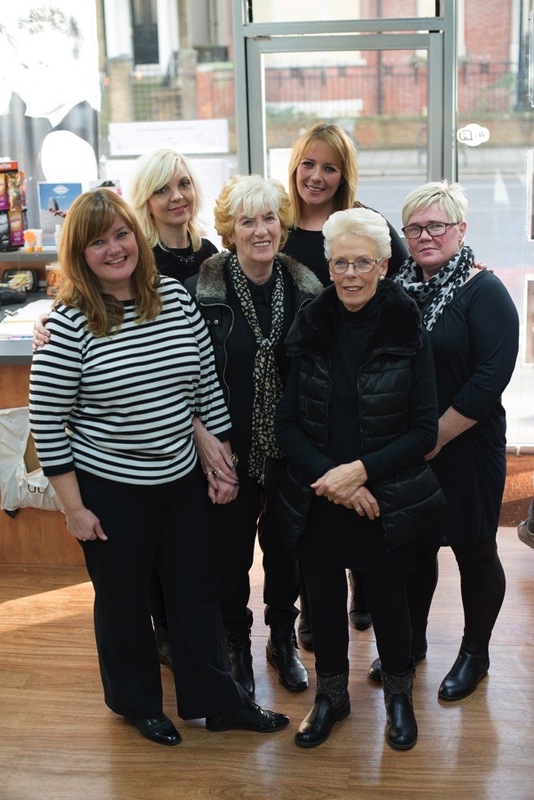 It was dedicated to the memory of a girl who had worked in the Beauty Parlour; this touching gesture seemed so typical of Marcia’s concern for her girls and the friendly atmosphere among the staff at the salon.